We slept a little later on Saturday, thankfully, since we weren't trying to get any autographing tickets. I was still pretty exhausted from the previous day, though. We started the day walking the floor and standing in a few autographing lines. I tried to enter every Kindle & Sony Reader drawing I could find, because I'd really like to have one of these. It was such a beautiful, sunny day that we decided to get lunch at the hotdog stand outside on 11th Ave and eat lunch sitting on a wall in the sun. It was quite enjoyable. Several teens said they don't like series. Surprising. All the panelists are girls; most say their guy friends don't read other than assigned. One has a guy friend reading Twilight. None of the panelists go to author events. Some live in small town; others say they'll only go to event for much wanted book. One teen said she liked both adult & YA books, but felt uncomfortable in adult section; felt like those books weren't for her. Teen panelists prefer to read "real" books to reading online. Several mentioned too many distractions online. After that, I attended the Book Bloggers panel, moderated by Book Club Girl. The panel was well attended, and there seems to be a lot of interest in how publishers, authors, and boksellers can work with book bloggers. Rather than trying to tell you about it, I'm going to refer you to this post and this audio recording. 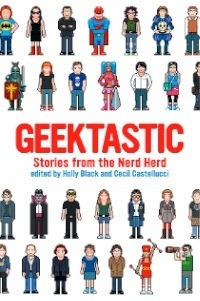 Saturday night I attended a party celebrating the book Geektastic: Stories from the Nerd Herd, edited by Holly Black and Cecil Castellucci and published by Little, Brown and Company. Geektastic includes contributions from some of the leading young adult authors. The party was held in a private room at the Lucky Strike bowling alley two blocks from the Javits Center. It was a great party and I had a lot of fun. Having the party at a bowling alley was a stroke of genius. As an introvert, I'm not a big fan of the kind of party where you're supposed to walk around and talk to people. If it's people I know, I'm fine with it, but I'm very uncomfortable walking up to people I don't know and making small talk. Having something to do - bowling and pool - provided a great way to get to know people without having to figure out what to talk about. I ended up spending most of the evening bowling with Sara Zarr, author of Story of a Girl, Sweethearts, and the forthcoming Once Was Lost, Andrew Smith from Little, Brown, and Diane Roback from PW. Sara was really nice and fun, and I'm glad to have had the chance to get to know her. Diane and I hit it off right away, and she gave me lots of good bowling tips. (I'm a terrible bowler.) With her help, I even got a strike! High five to all my bowling buddies, and it was great to meet you. In addition to Sara Zarr, I also met Scott Westerfeld, Holly Black, and David Levithan. Barry Lyga, whom I'd met the previous evening at the Kidlit Drinks night, was also there. Rachel Wasdyke from Little, Brown was a fantastic host (although a somewhat distracted bowler, LOL). If I met anyone else, I apologize for forgetting you!